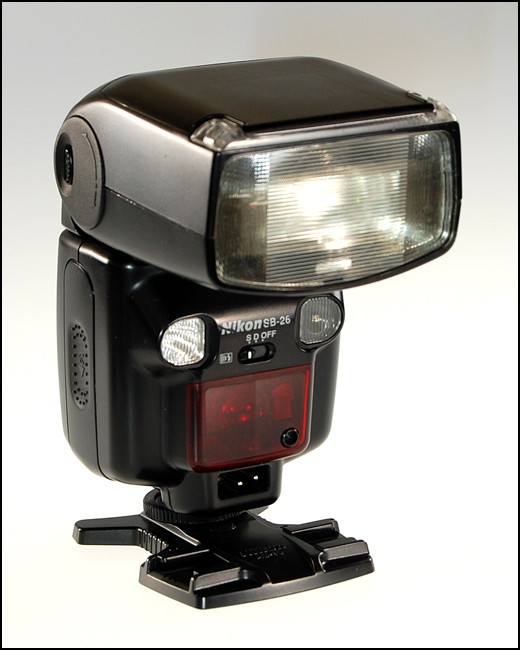 While TTL (through the lens) flash metering is the current norm, it wasn't always the case. Certainly within my memory, flash photography was part science, part alchemy, and a goodly portion of plain, old fashioned luck. TTL flash works on the assumption that if a sensor could measure the amount of light hitting the film plane in real time, it could be turned off when there was enough to give a proper exposure. If you look closely at the bottom of the mirror box, you can sometimes see the actual sensor pointed directly at the CCD/CMOS sensor where the film used to be. Since the sensor in the camera must control the output of the flash, flashes and camera bodies must be designed to work together to determine proper exposure. The sensor must also make allowances for the camera's current ISO setting. In a non-TTl flash, the sensor is mounted in the body of the flash, pointing directly at the subject. When triggered, a pulse of light is directed toward the subject. This pulse would continue until light sufficient for a proper exposure had been reflected back to the sensor, at which point any excess power would be dumped back for use during the next photo. This resulted in faster recycle times when the subject to flash distance was relatively short. If you're looking for a relatively inexpensive non-TTL Nikon speedlight, my first choice would be the SB-24, since it is the oldest and therefore least expensive to acquire. I checked eBay and saw several in the $60.00-$80.00 range. But once upon a time, there were much less expensive and easier to find, as this posting by David Hobby so attests. But compared to the build quality that $100.00 gets you these days, the SB-24 still a good deal. The second on the hit parade is the SB-26, whose claim to fame is the built in slave. The SB-25, SB-28, and the SB-80 are also good choices, though more expensive. Avoid the SB-50. External PC Connectors. The SB-24 and SB-26, along with nearly all high-end Nikon speedlights, have a supplementary PC connector built into the side of the flash body. You can connect a wireless radio triggering unit using a microphone to Nikon Locking PC cable on higher end triggers. Low end radio triggers will use the hot shoe. Variable Angle Output: The Nikon SB-24 had a built-in zoom feature that handled lenses for 24mm to 85mm. The SB-26 had a sliding wide angle plate that would increase the coverage for a 20mm lens. All of these angle modifiers, whether built in or add on, leave much to be desired when it comes to concentrating the flash output for the purposes of accenting a small, specific region, which we'll in a later post. The Control Panel: If you look on the front view of the flash, the Nikon sensor is very visible. It must always point directly at the subject, and whatever it sees will be the basis for how much light is delivered for that particular exposure. If you look at the LCD on the back view of this SB-26 flash, you'll see that it has been set to A (Aperture Automation), the ISO Selection set to 200, and the Aperture set to 5.6. The effective range, as calculated by the flash, is from 2.5 to 20 feet. What About The TTL Setting? Warning, warning, Will Robinson. The TTL on the early SB speedlights (SB-24, 25, 26, 28) setting does NOT work with any Nikon digital SLR, but surprisingly, works on the Fuji S2. Nikon went to the DX series of speedlights to be compatible with the D100 and D1/D1X/D1S camera bodies. So for all intents and purposes, ignore the TTL setting. Changing The Settings: Now comes the setting. If you hold the SEL button, the current aperture sitting blink, indicating that you may now change the selected aperture. Now by pressing the up and down arrow buttons, you can select smaller or larger apertures in one-stop increments, respectively. Push the SELagain and you can change the ISO settings, up or down, in 1/3 stop increments. One final press on the SEL button locks the settings. The flash will hold its settngs so long as it is installed and removed from the camera's how shoe when the power is off. And You Call That Magic? Actually I do, and here's why. The flow of light is now controlled by the flash and is completely independent of the camera. So if you're using an appropriate Nikon (like the D70) and attached a suitable speedlight with a neutralized syncrhonization cord, you can now achieve a level of flash automation even when the shutter speed is set to 1/2000 of a second. In fact, even faster shutter speeds are possible if the duration of the flash is shorter than the shutter speed. I consider the 1/2000 setting as maximum as I have been able to utilize nearly all of the light produced by a speedlight in the A mode. Future postings will show how a flash so configured and so connected can produce results that will amaze and astound.